The 2s pulled off a counterpunch win, coming from behind in each innings, to beat Penicuik and retain their 100% home record. Skipper, Carl, won his first toss of the season and invited the visitors to bat as the surface looked to have a little more in it for the bowlers than recently allowed by the Roseburn curator. The away side made a confident start, reaching 35 without loss after 8 overs. 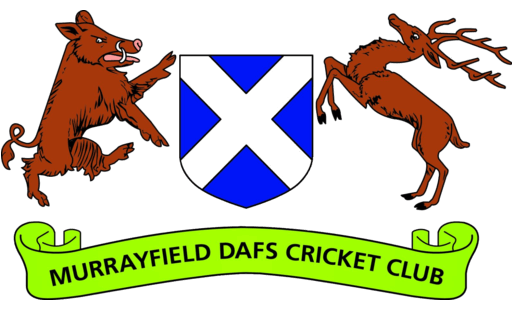 Norm had frustrated the Penicuik skipper into a big edge through third man and Adi saw a regulation catch off the same batsman go down at point – immediately followed by an ugly mow to long on for two and then a crisp six, handsomely struck, over long on. Demanding an extra over, Adi deservedly picked up the breakthrough, clean bowling the other opener. Tom and Devik took over with the ball and Devik made the breakthrough with a low full toss to earn us a bonus wicket and see the back of both openers. However, Penicuik again built an assured partnership, frustrating with a right-left combination and eased to 68-2 after 17; looking well set to push on for a big total. Tom had other ideas though and a great catch by Matt Restall, on 2s debut, in the covers off a well struck aerial drive, wobbled the Penicuik batting order. Next up, a straight one saw the back of the opposition number 5, trapped LBW first ball. Tom didn’t produce the goods on hat-trick ball but some sharp work at leg gully by Devik kept the new man on strike. The next was too good for a player facing his second ball, clean bowling him for a third wicket in four balls. As the new batsman hastily prepared himself, leaving the scorers’ table to reach the middle, only to find he was missing a key piece of protective equipment, we took an early drinks to prevent any embarrassing injuries, with Penicuik in relative disarray at 68-5 after 18 overs. The comfort of the extra protection didn’t help preserve another area worth protecting as Devik uprooted off stump with an inswinging yorker, as the unfortunate batsman fell to his first ball after reinforcing his defences. Another clean-bowled wicket in his following over gave Devik his third and left Penicuik 7 down for 75. A fourth should have followed as Devik clung onto an excellent one handing catch in his follow-through only to turnaround to the horror the umpire signalling a front-foot no ball. A player light, the batting side were essentially 8 down and looking unlikely to post anything like the score that they threatened during the first hour. A brief cameo from the number 8 was cut short by Norm, who returned to remove the remaining batsman, trapping one in front and bowling another without much fuss. In between, Matt Restall bowled a brilliantly-disciplined over, against the set batsman, to complete a maiden. A dedicated team effort in the field, a trusty display of committed keeping by Chris West behind the stumps and a few moments of individual brilliance by the bowlers restricted a threatening Penicuik side to 93. An expansive drive doesn’t come off second ball for the new man to leave Penicuik in trouble as Tom delivers a triple-wicket maiden. After a quick nibble, Russell and Saurabh renewed their opening partnership for the first time this season but, after confidently easing away the first ball for a couple, Russell nibbled his second to give a catch to the keeper and give Penicuik their opening. Tom fell shortly after, trapped in front to a ball from the skipper, which was narrowly adjudged to have pitched in line. Saurabh and Ali rebuilt, reaching 20 before Saurabh fell to an excellent catch held at first slip. Penicuik immediately sensed blood, as suggested by their fervently enthusiastic celebrations. Carl joined Ali at the crease but could only watch from the non-striker’s end as Davidson produced a triple wicket maiden to leave us in a precarious position at 26-6. The, sometimes feisty, opposition side helpfully reminded the skipper, at bat, that we had fallen for 46 last week and we were still someway short of that mark, let alone the target of 94. By the time the two following overs were up, we had defiantly beaten last week’s effort, with Carl using the pace on the ball to counter-attack. Norm joined in with a well-struck boundary and a helpful 4 byes of a well-ducked bouncer saw the score move on rapidly – doubling our score in less than 4 overs. With Penicuik offering little sign of a change-up in the bowling, other than a first change to allow one opener to switch end, the score moved to 64 as the quicks ran through their allocation. Carl was trapped in front, playing backwards to the first change off spinner, to fall for 25, our third LBW victim of the innings. Norm was joined in the middle by Westy to build a partnership of considerable experience, with 30 required for victory. In the 22nd over, a fourth bowler finally emerged, however the main aggressors had used up their quota. Nevertheless, a run of maidens followed, only broken by a wide delivery and the target looked distant. Summoning their know-how, Norm and Westy combined patiently to edge us towards the target as the well-supported cheers from the sidelines steadily grew more optimistic. Norm was the aggressor whilst Westy kept the bowlers at bay and we gradually accumulated extras. In the field, Penicuik went flat but there was still pressure on the pair to deliver with two nervous batsman waiting. Some belligerent blows from Norm were supplemented by bonus runs earned as byes with the away side not employing a fine leg and the target was within reach. A couple of good blows from Westy drew us closer and he summoned the energy and a full-length dive to support a tight double, eagerly called by the spectators. The commitment paid off and eventually tension eased as we reached 92 for 7: one to tie; two to win. A lusty blow from Norm over the top looked to seal the match, to the delight of the healthy support, but there was a twist as Westy waved without turning for a comfortable second, owing to a hamstring injury. A crucial 29 run partnership fell one run short of that required for victory as mid off nonchalantly plucked a stunning one-handed catch from the air, to no celebration, with Westy attempting to hit it far enough to hobble the single run required. Matt joined Norm in the middle, rehearsing the reverse paddle as he walked out. To the skipper’s relief, he confidently and composedly faced up with a straight bat to see out the over. The bat wasn’t necessary to complete victory as a bye at the start of the 37th over gave us the game with Norm unbeaten on 24. Another tight chase at Fortress Roseburn which we ended up on the right side of. We stuck at it in the field, despite strong opposition and were well-rewarded for our persistence to reach a target that was well under-par. Our batting response was initially under-par though as we struggled in the face of some quality bowling and the pressure of a chase. However, as we did in the field, we backed each other and two composed partnerships were enough to take us over the line to win in what was an excellent all-round team effort. Devik misses his length delivering a low full toss but the batsman is early on it. An excellent one handed grab goes to waste as the umpire indicates Devik missed the length on his run-up too: signalling for a front-foot no ball.